For todays Manners Monday, I’m going to cover a variety of table manners – answering a few questions plus throwing in some others. For this reason, I won’t go as in depth on each item. If you’d like more clarity, let me know in the comments and I’ll add to it. 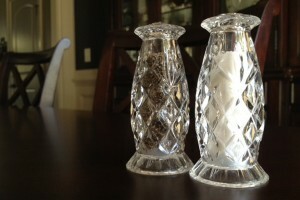 – Pass the salt and pepper together, even if a guest only asks for one. It prevents having to search for the lost shaker the next time someone needs one. – Napkins: In the lap as soon as you sit down, even if it will be a few minutes before you are served. If you need to leave the table during the meal, the napkin should be left to the side of your dinner plate, never in your chair. (You wouldn’t want your dirty napkin to stain your host’s chair.) At the end of the meal, place your napkin beside your dinner plate. Any other time you leave the table, it is polite to nod your excusal to the host, and it is unnecessary to say where you are going. It may be any number of reasons: blow your nose, go to the bathroom, etc, but those never need to be announced. And, yes, it is proper for men to stand when a lady leaves the table and when she returns. While even I will say that this rules is antiquated, it is nice to know that such a norm did once exist and honor it on special occasions. – Meat should be cut one bite at a time. It is impolite, suggesting that you plan to hurry through your meal, to cut all of your meat at once. Instead, cut meat with your fork in your secondary hand and knife in preferred (right if you’re right-handed), then place your knife on your plate, and switch your fork to your preferred hand to eat. Continuing to hold your knife and your fork (upside down) is called “continental” style, and while it is gaining popularity and acceptance in many circles and culture, it is still not preferred for a formal American dinner. – Hats: Women who are guests may wear hats at the table; men may not. Actually, men shouldn’t wear hats inside a building at all. For women, hats are, in their origin, a way to shade your face. It became acceptable to not embarrass a lady whose hair might be mussed by her hat, to allow it to become part of her accessories and remain in place. A hostess, because she hasn’t need of shade as she hasn’t been outside, shouldn’t wear a hat at her own table. – And finally, the way to indicate that you are finished with your meal is to place your fork and knife together at the 4 o’clock position on your plate. If someone is clearing your plate for you (at a restaurant or formal dinner) this will let them know that you are ready for your plate to be taken. Next week will be the last in this particular series, so I hope you’ll stop by. If you haven’t subscribed to Lit&Leisure, please drop your email in the “Don’t want to miss it?” box below and each post will arrive to your inbox. Also, I’m happy to address any final questions regarding table manners next week as well. Just drop me a comment below or email me at readbabbette (at) yahoo (dot) com.